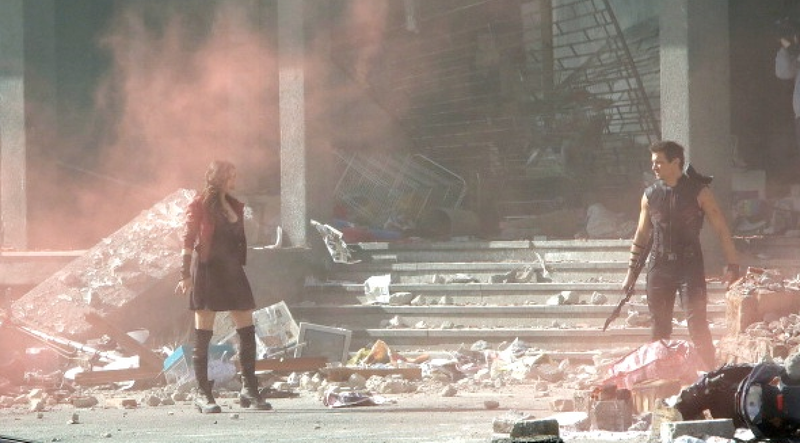 Avengers 2: Age of Ultron – First Look at Scarlet Witch, Quicksilver, and Ultron? Last week we got a first glimpse at Avengers 2: Age of Ultron during Marvel’s special on ABC titled “Assemling a Universe”. Well the Marvel crew has set up filming in various other locations around the globe as we speak, but it’s the filming in Italy that people are talking about most today. Originally thought to be only a Hawkeye scene, we get our fist look at Scarlet Witch, Quicksilver and one of Ultron’s bots. No concept art here. Just pure film goodness. 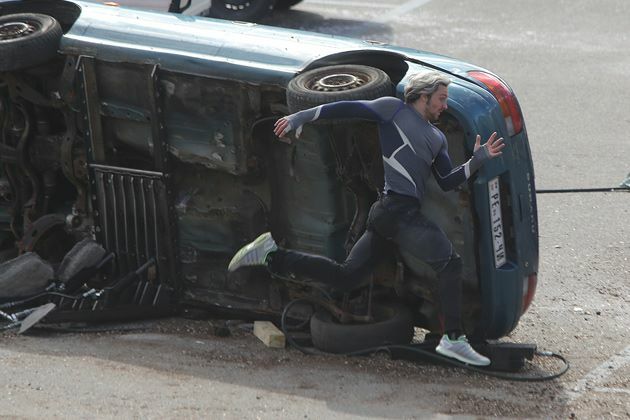 Over the weekend filming began in the Northern Italian region of Aosta for Avengers 2: Age of Ultron. With snipers and militia overrunning the fort, it seemed as though this was a solo mission of Hawkeye aka Clint Barton played by Jeremy Renner. Now thanks to some new on location images, it seems that this is no mere spy mission, but is rather a rescue mission. He’s still got it. 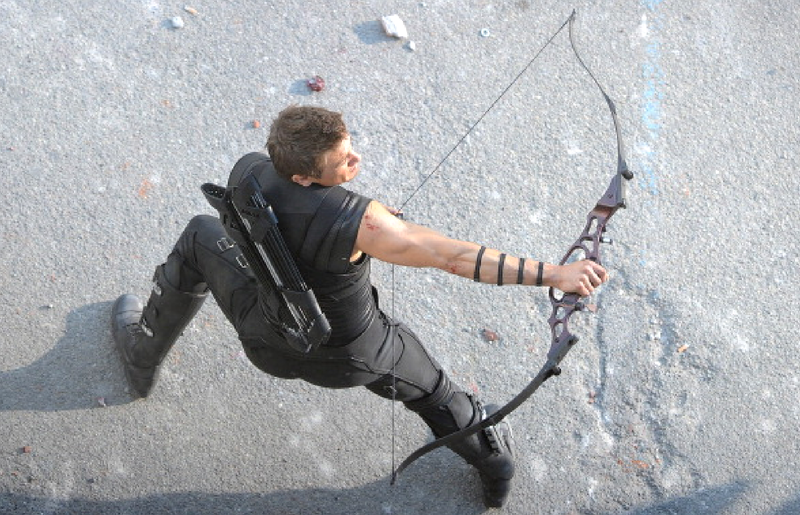 Hopefully Hawkeye doesn’t run out of arrows this time around. With destruction and innocent victims everyone, Hawkeye finds himself helping to stop an invasion it seems, but he’s not alone. Joining Hawkeye are the twin “miracle” – as rumor has it they’re referred to instead of mutant – Scarlet Witch played by Elizabeth Olsen and Quicksilver played by Aaron Taylor-Johnson. If those two names sound familiar, it’s because I mentioned both of them in my Godzilla (2014) articles. These two not only play the married couple Ford and Elle Brody, but also this brother and sister combo – married one film, siblings the next . . . awkward. Costume-wise these two look awesome. They might not have as flashy an outfit as they did in the comics, but this is a good way to introduce these two as normal individuals – without any of S.H.I.E.L.D.’s monetary backing. After all, Marvel Studios has been great at making these outlandish characters realistic thus far. So these two “miracles” shouldn’t be any different. Though the real kicker for this shoot is the images of this mechanical monstrocity. 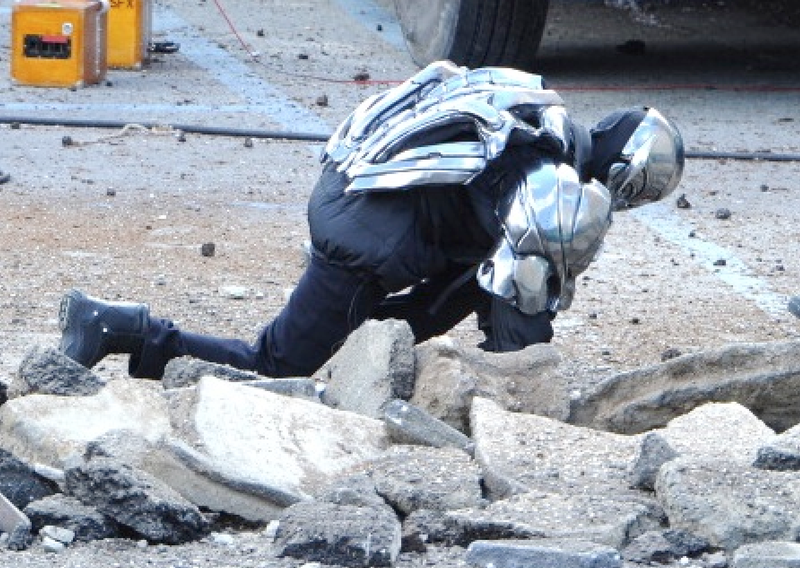 Some have speculated that this is Ultron himself, though I’m a little hesitant to make that leap right now. I’m more willing to believe it is one of his Ultron-bots – since we did see Quicksilver fighting a bunch of them in his concept art. Also, the mask doesn’t have the characteristic Ultron look to it. Ok, that is extremely badass looking! Either way, we’ll see what this all turns out to be, but it’s so exciting to see this actually take shape. I’m almost certain we’ll have something in time for San Diego Comic Con this summer. No shiny scarlet red dress. This witch is just a normal 20-something girl . . . with superpowers.